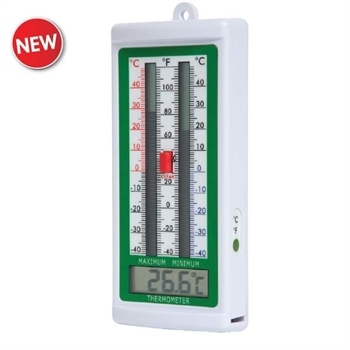 This max/min, classic design thermometer simultaneously displays the actual temperature whilst displaying the max and min temperatures on a digital LCD bar graph. The thermometer measures temperature over the range of -40 to 40 °C with a resolution of 0.1 °C/°F and an accuracy of ±1 °C. To switch the current reading between °C and °F simply press the button on the side of the unit. To reset the recorded max and min temperatures simply press the red 'clear' button. The unit is housed in an ABS case which incorporates a slot for hanging and is powered by a single AA battery (supplied). Initial indications show this to be a good product. A couple of weeks in the greenhouse and no issues so far. Brilliant I went into greenhouse yesterday and it was 101.5 my manual one I also have was nowhere near yours.